Looking for Large Format Posters? View our Cheap Poster Printing prices on a choice of 190gsm Silk and Gloss. Sizes from A4 - A0 with Next Day Delivery available. A1 full colour posters litho printed full colour 1 side on 170gsm silk and available with 3 service levels. Delivery dates for each service level can be seen in the bar below. One of the best ways to get highly visible exposure for your business or event is to use A1 posters to promote it. Large, full colour posters are an effective way to create a memorable impression that will ensure that your message gets out. At quadrantprint.co.uk, you can upload your own artwork to create your own custom A1 posters, while our modern litho printing process makes your posters even more affordable. Our prompt delivery service also ensures that you won't have to wait long for your posters to get to you. The posters from quadrantprint.co.uk are printed on 170gsm silk paper stock to ensure the highest quality product, and we offer free delivery on all orders to U.K. mainland addresses. There is a choice between four-day, two-day or one-day production times, making it possible to have your posters delivered to you within a few working days. For jobs that require a faster turnaround time, we also offer a next day A3 Poster Printing service for orders placed before 1pm that ensures delivery on the next working day. Print batches start at 125 posters for only £211, and the cost of each poster reduces even further to less than 30p for larger orders. 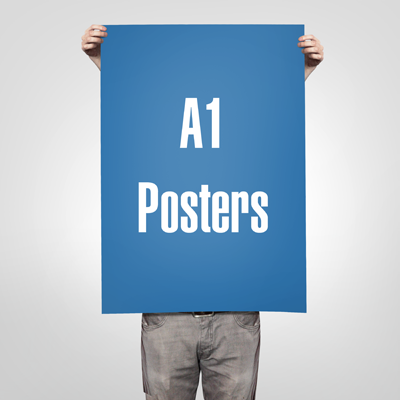 The artwork for your A1 posters can be uploaded in a variety of formats, and the poster design process is a simple series of steps that takes only a few minutes to complete. At quadrantprint.co.uk, we also offer an affordable professional artwork and design service, beginning at just £105, to help you create the best possible custom poster for your requirements. A1 posters are still one of the best ways to get peoples' attention, and with our modern litho printing process, it is now easy and affordable to create individual, full colour A1 posters for any purpose. The A1 poster printing service from quadrantprint.co.uk makes it easy and affordable to create your own A1 posters. A range of service levels gives you control over how quickly you will receive your A1 posters and delivery is free to all mainland UK addresses. The A1 posters from quadrantprint.co.uk are all printed on 170gsm silk paper to ensure the highest possible printing quality. Our A1 posters can be created using your own artwork, making them even more cost effective. Full colour A1 posters are an effective way to advertise a business or an event, and our inexpensive litho A1 poster printing service makes using promotional posters very affordable. Because we can deliver print batches as small as 125 A1 posters, it is possible to order just the number of posters that you want to buy as you need them. Our prices start at £211 and fall to less than 30p for larger orders, making A1 posters a very cost effective marketing tool for any business. At quadrantprint.co.uk, we also offer a professional artwork service to help you design the right poster for your needs. It is easy to use your own artwork and our A1 poster printing service allows you to upload your designs in a variety of common formats. Using the A1 poster printing service at quadrantprint.co.uk is very easy and once your artwork is ready, it can be completed in only a few minutes. Our choice of service levels allows you to pay for express delivery; and all delivery dates are shown on the products page which ensures delivery on the day of your choice. Creating customised A1 posters at quadrantprint.co.uk is quick and easy, and with our range of options, there is a service level to suit every budget.